I. Beatus, qui praesentem hanc vitam odit ac deserit, & in solo Deo meditatio vitae suae est. 1. Blessed [is he], who hates and abandons this present life, and in God alone is the meditation of his life. α’. Μακάριος, oς μισήσας κατέλιπε | τόν βίον τούτον άνθρώπινον, καί σύν Θεώ μονωτάτω | ή μελέτη | τής ζωής αυτού | έγένετο. 1. Blessed [is he], who hated [and] abandoned | this human life, and in God alone | the pattern | of his life | there came to pass. The “μισήσας” is an active aorist participle; the κατέλιπε is a 3rd person active aorist indicative, neither of which is obviously rendered by an English present tense. (The έγένετο 3rd person aorist indicative middle is familiar to everyone as “there came to pass”). I’m quite sure that Ambrogio Traversari knew vastly more Greek back in the 15th century than I know now. But all the same… this is not a good translation. Getting the verb tenses right is important. It’s poetic, much the same meaning, but not good. 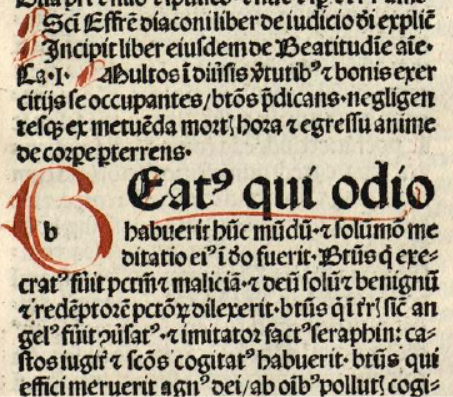 Beatus qui odio habuerit hunc mundum, et solummodo (?) meditatio eius in deo fuerit. I.e. Blessed is he who held this world in contempt, and alone his meditation was in God. Better tense rendering, anyway, although not very close to the original. But how interesting the use of the word “meditatio” in both cases. At this point I consult Souter’s Glossary of Later Latin which includes uses for meditatio such as “thinking”, “study” and “carrying out”. All the same; neither is that close to the Greek. UPDATE: Please see the comments for corrections of my mistakes. In particular, I should have looked at Lampe’s Lexicon of Patristic Greek for μελέτη! I don’t know why no-one has expressed their thanks to you for all the exhaustive (and exhausting) work you have devoted to Eprhaem Graecus in your recent posts, but I’m sorry that being the first to comment, I am doing so with a correction. In Lampe one of the main meanings of ή μελέτη is given as ‘meditation’ – the primary meaing being ‘care, attention – so ‘pattern’ is rather off-beam, and ‘meditatio’ would indeed be the nearest Latin equivalent..
Corrections are always welcome! Oops! In the first part, translating with ac/atque “and” may weaken the sense of the participle μισήσας: “having come to hate it = because he hates it”. But ac/atque can also connect two sentences “in the order of thought: and so, and thus, and therefore” (L-S), so “odit ac deserit” = “hates and so has abandoned”. I concur, Roger’s work on these texts deserves all the recognition it can get. Thank you! Thank you – that’s really helpful. I didn’t feel that I had the meaning straight at all. I’ve been reading about bios vs. zoe, or however you spell them; and the difference between these close synonyms seems to be exploited nicely.